Anyway, last year I got myself a nice humidifier that I turned on in my bedroom at night. This has helped somewhat, and this summer I've only had a nose bleed three times. This morning was the most recent episode. I have the humidifier going next to me even as I write this post. The most common causes are dryness (often caused by indoor heat in the winter) and nose picking. These two things work together--nose picking occurs more often when mucus in the nose is dry and crusty. Other, less common, causes include injuries, colds, allergies or cocaine use. Children may stick small objects up the nose. Older people may have atherosclerosis ("hardening of the arteries"), infections, high blood pressure and blood clotting disorders, or they may be taking drugs like aspirin that interfere with blood clotting. The cause of nosebleeds often can't be determined. If you get a nosebleed, sit down and lean slightly forward. Keeping your head above your heart will make your nose bleed less. Lean forward so the blood will drain out of your nose instead of down the back of your throat. If you lean back, you may swallow the blood. This can cause nausea, vomiting and diarrhea. 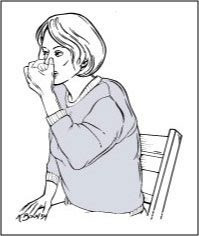 Use your thumb and index finger to squeeze together the soft portion of your nose. 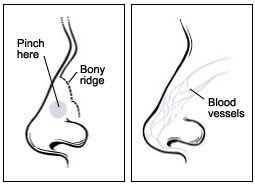 This area is located between the end of your nose and the hard, bony ridge that forms the bridge of your nose. Keep holding your nose until the bleeding stops. Don't let go for at least 5 minutes. If it's still bleeding, hold it again for 10 minutes straight. You can also place a cold compress or an ice pack across the bridge of your nose. Once the bleeding stops, don't do anything that may make it start again, such as bending over or blowing your nose. If you can find the nosebudd anywhere, try it. The thing's genuis. Thanks for the tip, Aaron. I think I will get it!